Imagine if you told a patient you’d charge them $1,000 for a root canal. Then they get the bill in the mail and it says they owe $1,250. The patient would probably be upset right? Dental schools are effectively doing this to dental students all around the country with faulty cost estimates of dental school. Right now the typical dentist I consult with has a student loan debt of around $400,000. There is a big range around this student loan average and most clients have between $200,000 (state school w/ in state tuition) to $600,000 (specialist who used forbearance during residency). However, these numbers are going to get far worse in the future. Consider the current published cost of a Tufts Dental School education according to their website. Here’s the thing. These numbers just aren’t true for an entering first year. They’re based on current cost of attendance. You cannot lock these numbers in any more than I can go buy season tickets to the St. Louis Cardinals in 10 years at today’s rates. 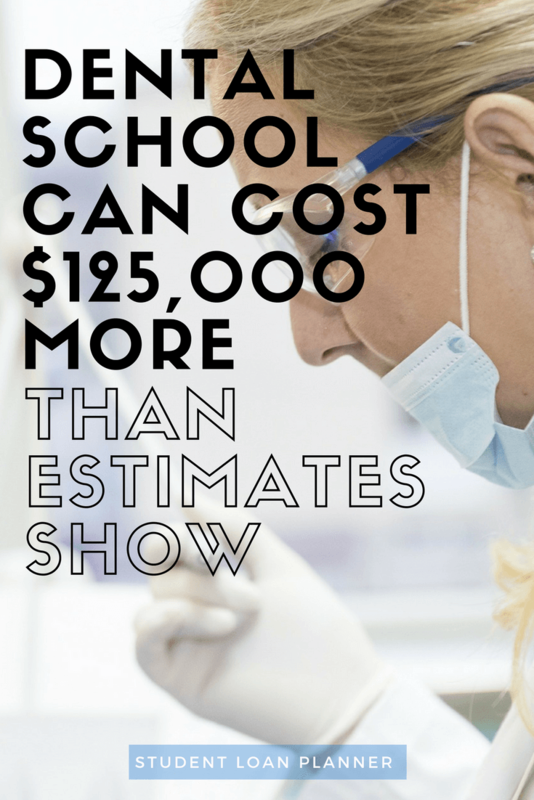 Dental schools should show the expected four year cost of attendance and take into account probable 5% tuition and fee increases per year and factor in inflation into the cost of living. Tufts lists the cost of tuition at $70,712 each year. That’s totally wrong. Tufts officials KNOW that they will not be leaving tuition alone for an entire four year period, as do the other dental schools that list their expected cost this way. These numbers also leave out the crucial fact that loans accrue interest while you’re in school. I’ll use a 4% rate of increase in the total cost of attendance in my real estimate of the four year cost of Tufts dental. I’ll also assume that you accrue interest at a rate of 7% per year and that you borrow the entire cost of attendance. The total will represent the true cost of Tufts Dental for the class of 2021. I picked on Tufts because it is one of the country’s most expensive dental schools. Even so, these numbers are very typical of private dental schools or out of state public schools. The cost estimates never account for tuition and fee increases that will almost certainly happen. The estimates also leave out the cost of interest accumulation while you’re in school. I’m no lawyer, but I think future dental students burdened by mountains of debt might have few options left but to pursue a class action lawsuit against the university for false advertising. If the four year published cost is $425,000 but a typical student leaves with $550,000, the published estimate is wrong. I’ve verified this is what happens by speaking to hundreds of dentists with six figure student debt while doing student loan repayment consults. They told me how their school would give them a tuition increase notice, but they never thought about comparing that to the published cost of attendance when they were applying. One dentist kept the cost estimate he received at orientation and shared it with me. The two figures of what they told him he would pay versus what he actually paid were wildly divergent. To get a realistic idea of how much dental school debt you will have at graduation, you need to make some adjustments to the numbers the school gives you. Assume each year, dental school tuition increases at a rate of 4% (as long as they are more applicants than seats, the price of a dental education will go up). Project a 4% rate of inflation for living expenses just to be safe (most schools assume constant personal expenses for all four years, which is unrealistic). Then account for accruing interest at a rate of 7%. D1 expenses accrue for four years, D2 expenses accrue for three years, etc. Increase the result by 2% to account for the ~1% origination fee with Stafford Loans and the ~4.27% fee with Grad Plus loans. Here’s what NYU Dental school lists as the cost of dental school for the class of 2023. The grand total would be $517,812 if you borrowed only the dollars listed on the dental school cost of attendance. 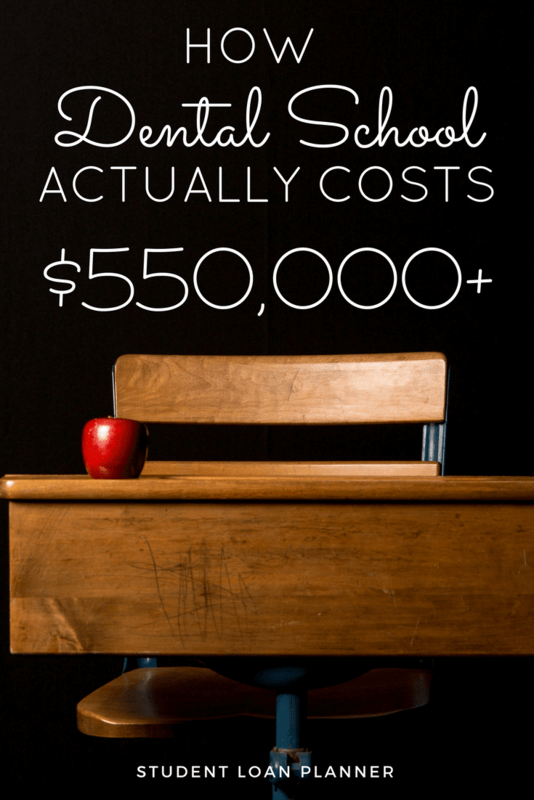 Let’s look at the first year educational cost of $95,276. We’ll need to multiply $95,276*(1+0.07*4)= $121,953. This is the impact of accrued interest. We’ll also increase this by 2% to adjust for origination fees, so $121,953*(1+0.02) = $124,392 is my projection of the indebtedness for the first year’s educational expense. For years besides year 1, we should assume a 4% tuition increase. For the fourth year living expense of $37,858, I’ll adjust for four year’s worth of 4% inflation, assuming the financial aid office doesn’t have their pulse on the local real estate market. That makes $37,858*(1.04^4) into $44,288. Now tack on one year of accrued interest at 7% plus 2% origination fees, and that’s equal to $44,288*(1+0.07)*(1+0.02) = $48,336. That’s the number we’ll use for that year in terms of how much debt a graduating dental student would have. Making all the adjustments I demonstrated above, here’s what the cost would look like in terms of what the dentist would actually borrow for each year. The grand total of debt that a rising first year student could expect to owe at graduation would be about $664,154. Compared to the $517,812 cost listed online, that’s about 28% higher. Caveat Emptor (may the buyer beware). There are a host of different strategies to mitigate a huge dental school student loan bill. If you owe a lot relative to your income, you should optimize the government repayment programs for maximum benefit. If your debt to income ratio is moderate, then shopping for private refinancing rates will help. I have affiliate agreements that get you $200-$500 for refinancing that you don’t get if you visit the companies’ websites directly. Outside of some miracle, you’re going to have to pay back this debt. 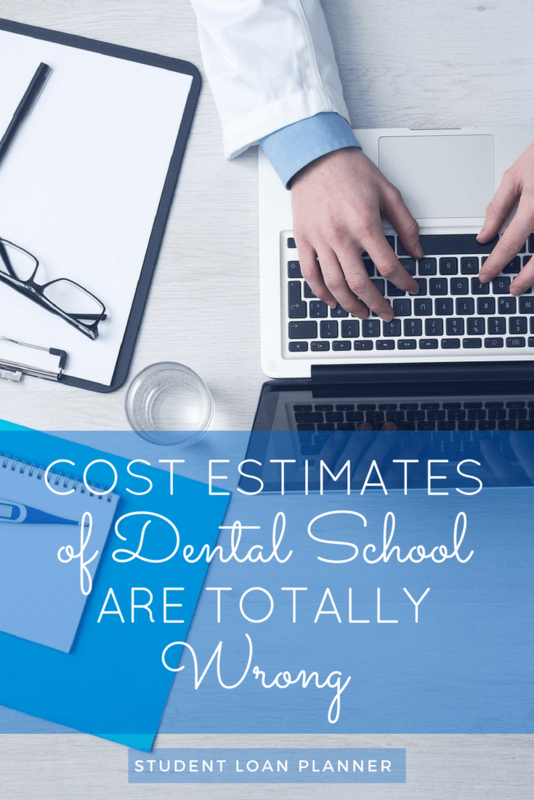 The same financial aid offices that produce cost estimates of dental school that are wildly inaccurate might not provide the help you’re looking for. If that’s you, I can help. You can help future dentists by warning them to add 20% to 30% to whatever total four year cost estimates of dental school that their prospective program hands them. We help dentists and dental specialists like you conquer huge student loan balances with custom student loan plans. If you owe more than $200,000 and have anxiety about what to do, we’d love to clear things up for you for a one time flat fee. I perform a holistic loan analysis with my proprietary simulation tool to see what your best available repayment options are (government, private refinancing, etc). The cost of dental school is high enough without making a bunch of repayment mistakes and making it much worse. Focus on owning your own private practice, fixing your cash flow so you can grow your assets, and start living financially free. We’ve advised more dentists than anyone else in the country (currently closing in on 400 clients and over $150 million advised just in the dental world). If your dental school overcharged you for your education, we’d love to review your options and maybe save you tens of thousands in projected dollars long term. This is scary, ridiculous, and infuriating. And then unlike what most people think, a dentist fresh out of school can’t open his own practice. And having your own practice isn’t all it’s cracked up to be either. My dentist in NY had a lucrative practice and worked six days a week, not because he wanted to. I’m glad you’re able to provide needed help navigating the loan process. Happy New Year from Mr. Groovy and me! Thanks for stopping by Mrs. Groovy. Hope you guys had a Happy New Year as well! Just trying to do all I can to help dentists increase the return on investment from their degree. 2. Schools can charge and scalp the way they want because they portray dentistry as a lucrative field and have the government backing them up with guaranteed loans. until this scandal is exposed and the government’s willingness to hand out the loans so freely stopped, there is no stopping the schools from doing what they want. the best way to handle the current situation might be to say no. i mean it. being a dentist can be good, but so can dozens of other professions if done and planned correctly. no one HAS to be a dentist, it’s a choice, and people can choose against placing themselves under economic slavery. by the way, i am firmly against your advice about having new graduates focusing soley on the so-called high cash flow offices. if you look at dental broker sites, these offices are the ones who sit around for a long time without any buyers for good reason. it is very likely that after buying such an office you cannot sustain the previous owner’s cash flow (assuming he didn’t cook the books) for many reasons. and you’d be paying at a full or higher price for such an office–not wise. AND you are assuming that the recent grad has business knowledge on how to run such a complicated business. very dangerous. Great points Jeff. I’ll concede that buying a high cash flow office could certainly be dangerous. The default rate on dental practice loans is still extremely low though, so would you surmise that the defaults that do happen are disproportionately from these high cash flow offices purchased by recent grads? Unless you pay 100% of production for a practice that should’ve been 66% production, if you work 2 years at a corporate office then you’re giving up 2 years of getting out from under the practice loan sooner. I know that there’s a lot of downside, but I’ve spoken to a few brand new grads that bought high cash flow practices and it could also work out positively. That I can get behind Travis. For anyone (not just recent grads) to run that kind of high cash flow office, some sort of business skill is a must (and I don’t mean just observing as an associate). When you run an office, problems pop up everyday and it take a lot of skill to render clinical dentistry and be a biz owner at the same time. It’s overwhelming sometimes, really, even for someone who’s seasoned. To have a newbie borrow another million and throw himself in that in that deeper end is just highly risky, from my perspective. And trust me when I say that those high cash flow offices are not necessarily what they seem at times, as well. You present valuable info for dental students, & pre-dent students. My junior colleagues MUST examine the economics. And too often, those presenting the financials aren’t giving full disclosures & a true picture. Our federal government in a seemingly noble effort to increase “access to care” (dentists needed in Lite-My-Fart, MS and the Killing Field neighborhoods of inner cities) sponsored these student loans. Insanity! Now, we’re in a difficult situation w/ a gross oversupply of dentists, for the economic realities. Believe me, if you’re somehow looking for government to fix Medicaid where there’s incredible “need” but little “demand”, you’ve sparked up the glass pipe once too often. The employment options for many recent grads is very grim. I’ve known far too many involved in Medicaid felony-fraud, in order to pay down disturbingly high student debt. Further, government prosecutors would far rather target a young doctor, than the corporate managers pulling the strings. Getting out from under these troubling high debt loads is critical. Servitude as professional indentured servants is NOT a pretty picture. Thanks for sharing this travis, people need to know what is really going on! Out-of-control tuition and school costs explains in part why dental care in America has become so totally unaffordable. Some Americans (including me) go across the Mexican border for dental treatment where the cost is about 30% of what the USA dentists charge for the exact same services. Action needs to be taken across the board to drive the costs down. This would include making dental schools much cheaper, forcing much lower cots for dental equipment, and making dentists conspicuously disclose their prices for common procedures so patients can comparison shop. Unfortunately the taxpayer is subsidizing dental schools to raise their tuition to ridiculous levels by providing for unlimited loans to cover the full cost of attendance through the Grad Plus program. Until that changes, costs will continue to rise for dental schools and dentistry as new grads have to cover the cost of their education. Thanks for warning me. The opportunity cost is too high especially since I want early financial independence. I’m going to get my CPA instead. You literally saved me decades of my life! Sure Mike, dentistry is definitely not a career for those who want financial independence at a young age. You could get there by 40 for sure, but I feel like 30s is almost out of the question. I’m actually more surprised than ever because I’ve reached the conclusion that a dentist likely will never catch up to a CPA period. Breaking down the numbers, if I lived and worked like a dental student and put most of my income during those 4 years toward investments like real estate and index funds, I don’t think dentists ever gain ground. This is assuming that they both work FOREVER. If I’m extremely conservative and graduate at 26 with 400k debt and 100k in lost investments and both are 4% interest after subtracting inflation, I have to pay 20k each year just to not fall further behind the CPA much less make up any ground. If I make $150,000 and pay 30% in taxes, that leaves $105,000 take home pay minus the 20k interest means it’s actually $85,000. If I live on $35,000 and throw $50,000 toward the debt/lost opportunity cost, I’ll take 10 years! As a 36 year old dentist, I’ll be in the same financial position as a 26 year old accounting/cpa. That’s neglecting the fact that the CPA continued to invest all those years from 26-36 while the dentist was paying down interest + debt. The CPA might be making more than the dentist when accounting for salary and passive investment income by age 36! And that’s assuming dental school debt is ONLY $400,000 and not even higher. Even if my focus was on retiring rich rather than early financial independence, dentists can’t beat out CPAs. The opportunity cost of the time value of that $ is simply too great. That’s insane because I’m assuming at least half of pre-dents are doing it for the $, but this proves otherwise. Did I miss something? I had no idea of what the loans really meant, but I got a good job out of school and paid off 285k in debt in just 4 years while maxing out retirement. I just bought a successful practice in a rural area where the old dentist is referring a lot of procedures out. I have A lot of optimism for my future in dentistry but I know of a lot of people in different situations. I know someone who went to tufts that had over 600k in debt and the new dental school in St. Louis charges an absurd amount. Very true Tom. You’re definitely onto something with your practice purchase approach. I constantly tell new grads it’s the only way to get an adequate return on investment for their dental degree. You might be leaving out just a few things. 1) If you’re savvy, you don’t have massive debt coming out of school. Go to community college while working, transfer to a 4 year school. Live cheap through dental school while strategically going in state. Make solid business decisions when setting up your business. 2) Buy the land your practice is on. 3) people will never forget you and be brought to tears when they can smile again. Can a CPA do that? To each their own, but a crafty moral dentist can make far more than a CPA. – Good luck. Wow this is really eye opening, thanks for sharing travis. my friend in the Ukraine has a degree already but needs one for the usa how much will it cost her for school?